I do pop in from time to time and see what's up with the ol' forum, though. Some of you haven't changed (that's both good and bad), some of you made progress in-game and out, nice to see you guys doing okay. As for me, I just wanted to show another update on my Bowmaster. Only gained 5 levels since I last posted this character but it's progress. I've also never shown my equips so I figured I'd do so now. 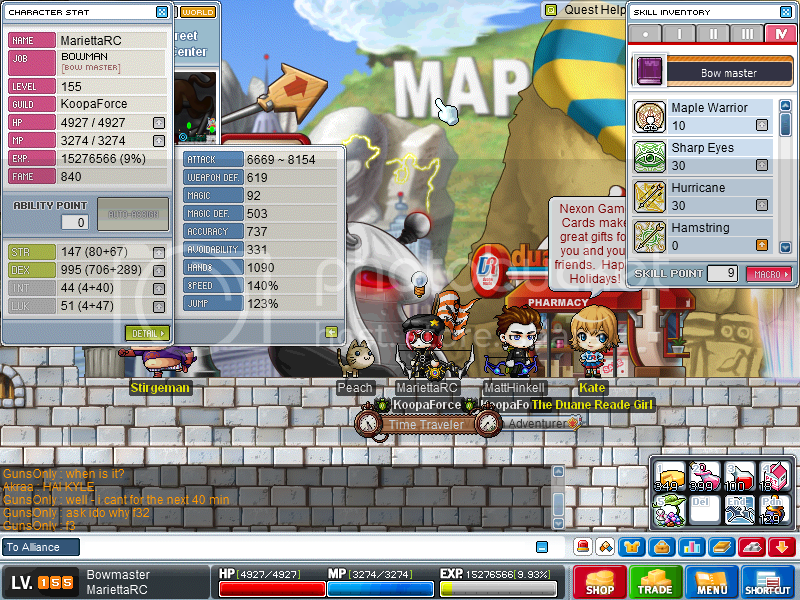 I'm nowhere near done upgrading my stuff but I'm busy outside of Maple as well, what with college work and all that. Also shown: Sheila stalking me. HI SHEILA. Not shown: Bow Expert is at 27, Phoenix and Dragon Breath are both at 1. Currently working on getting Maple Warrior 20. As you can see, I have FAR too much STR right now... I only need 125 total to equip my bow but certain potential stats and items have had me exceed that amount by a bit too much. Not to mention my base STR is a tad high now by itself when it was fine before. :b I'll be working on that later on. all your stuff is so nice ;-; its not fair! MoNs can't be potentialed due to lack of slots. And I'm actually going for a Chaos Zakum Helmet. Free 10% HP! And I'll potential that, of course. Just curious on how you scrolled your weapon. Did you use white scrolls/Pam's song/other helping item or did you take a chance until you were able to land 9 in a row? If not, B> SE mule services. No way could I ever get that lucky. I used Pam's Song. I forgot how many I used but I definitely won't be doing that again. are you sure you really forgot how many songs you used... but rather you dont want to remember? they're $19.50 a pop, no one wants to remember spending at least $50 on one weapon. HEY, go level once to have over 1000 total DEX! How much do you have on your MW20 fund? Right now I'm working on my goggles because they're the ONLY item that don't give me potentialed DEX. D< Stubborn things keep giving me STR or some other useless stat. After that, I'm gonna get me a CZak helm, hopefully... if the game doesn't crash when I try. I like earning my items but it's hard when the game doesn't like Windows 7 users. After potentialing that, I'll work on getting 6% DEX on my stuffs. MW20... I wanted to earn that too but I've had MW10 for too long and see the above problem. So I'll just save up for it. I hadn't started saving up yet but I'm selling some items that will surely give me enough for it. Also, I just got a 3% DEX, 3 lined cape, so I have 1015 DEX with MW10 now! Edited by MariaColette, 03 October 2010 - 03:29 PM. I'd rather earn my items too, but I suffer from the Vista/7 issue that you do. I haven't been able to see a zak run end since my F/P got his helm, well no, my bucc made it to see zak die&see his drops along the ground, THEN the game crashed. do you merch for your NX, or do you just buy? i always have the worst luck with cubes... so don't worry about your potential woes lol. T'is both. I bought the NX for my bow and some of the cubing but everything else was meso/MTS-bought. I plan on just plain MTSing for the rest of my cubes, I'm just horrible at it. >_> I don't merch generally, though. 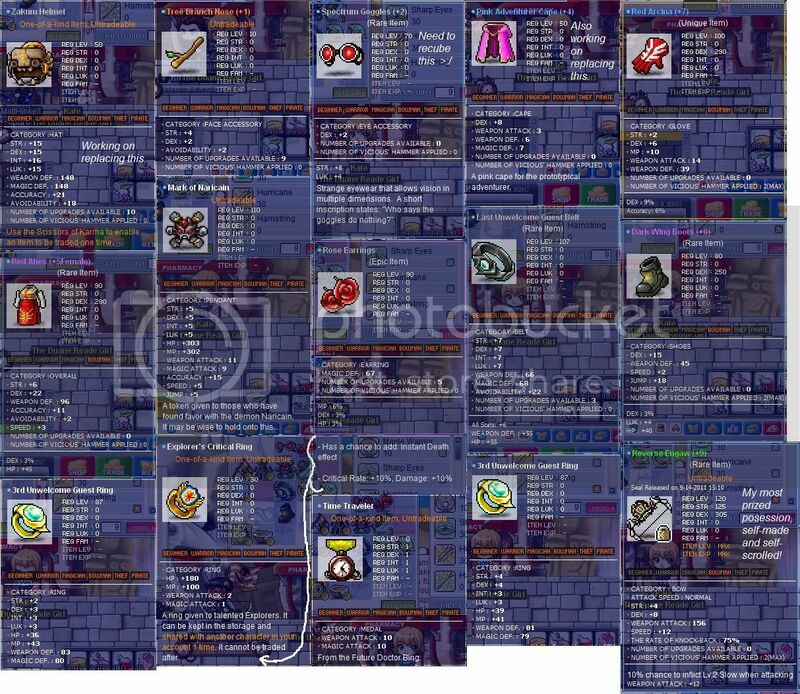 I just sell whatever I get that's worth selling, be it scrolls, event items, apples from APQ or time pieces. I also had some help from a special someone in making/getting some of these equips.